Liverpool ran riot in the early stages of the second half against Chelsea, with Mohamed Salah scoring with a stunning strike from long distance. Sadio Mane had given the hosts the lead early on after the restart, with Liverpool dominating in the first half and creating the best chances. However, Salah was yet to step up and make his mark on the game, but he did so in incredible fashion in the 53rd minute, as seen in the video below. 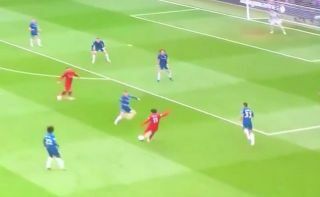 The Liverpool talisman picked the ball up on the right wing and made his way towards the box before unleashing an unstoppable strike past Kepa Arrizabalaga. It’s surely a contender for goal of the season, with Liverpool now heading towards three points as they had to respond after Manchester City’s win earlier in the day against Crystal Palace in what continues to be a thrilling Premier League title race. WHAT A GOAL MO SALAH!